Flashback post from where I would rather be… I do love a good high tea, and after the amazing one at Raffles in Singapore, I was keen to see what Seoul had to offer. 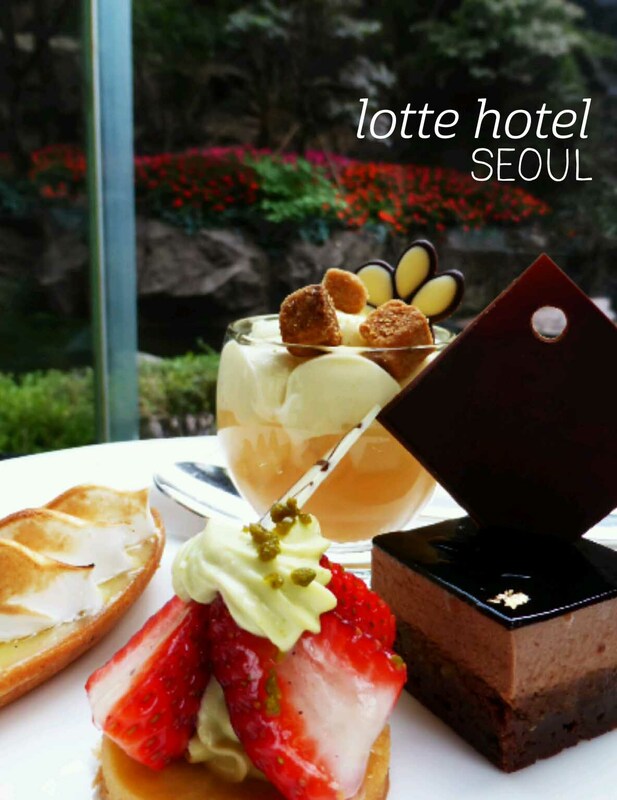 Quite a few places have an afternoon tea, but the Lotte Hotel one sounded just right for us, so off we went on a weekday afternoon. We were pretty gobsmacked on arrival to see that our table was seated right by a window overlooking… a waterfall. Yep, it was a seriously beautiful view both outside and in, with high ceilings and chandeliers creating a classy setting in The Lounge itself too, which was only enhanced by the string quartet that played throughout the afternoon. I chose earl grey as my Ronnefeldt tea, but we were both surprised to see that the tiered tray only came with one of everything, so we had to slice things in half. The savoury sandwiches were rolls, including a quid ink one with salmon, a seed one with crab and a brioche with beef, and they were probably the best savouries I’ve had at a high tea anywhere. Other highlights included the opera cake, orange and poppyseed cake, and strawberry custard tart. Completely luxurious and decadent. I’ve been following Nutrition Republic on Instagram for a while now and have been impressed by how fresh and amazing everything they make looks! On a recent trip to Adelaide we stopped in to try their raw cakes for afternoon tea. It was close to their closing time (4pm), so we go our cakes in takeaway trays rather than on plates. The staff were really friendly and happy to answer my questions about the food – everything here is designed to be considerate of dietary requirements, and the raw cakes ($8 per slice) are all dairy and gluten free, as well as being vegan to boot! I picked the vanilla bean and berry cake with its pretty layers of colour. All of the cakes do contain nuts of some kind, and these (cashews and almond) help make the base of the cake. 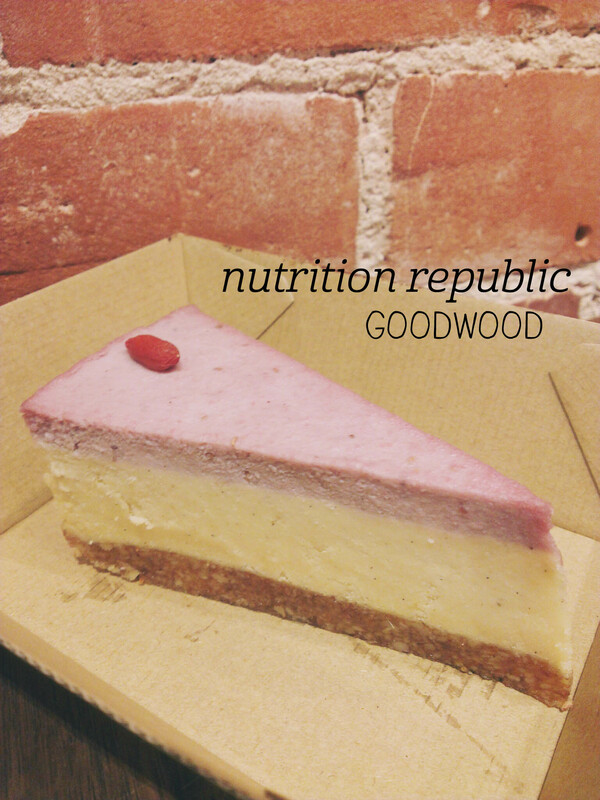 I love the texture of raw cakes – they remind me of cheesecake – thick (but light), rich and smooth. The vanilla flavour was nicely combined with the berry flavour, so it wasn’t a strong artificial vanilla taste, but a blended, more complex flavour. The slice looks small but was really filling – a lovely treat! I’d never heard of Spats when my friend suggested we stop in, but was happy to roll with it given how similar our tastes are in dining venues. 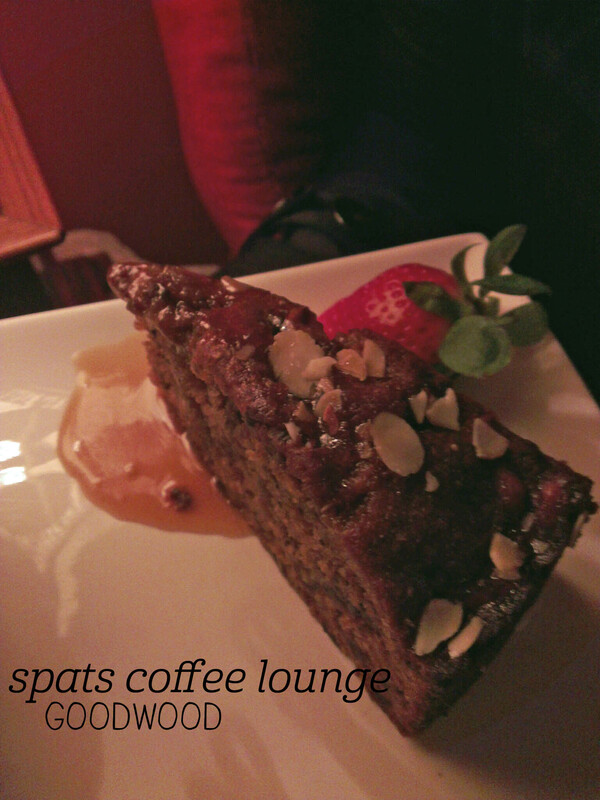 Spats announces itself as ‘Adelaide’s first and finest dessert lounge’, and not having a point of comparison, I’m inclined to agree. The store is wonderfully cozy, with dim lighting (chandeliers, candles! ), red walls and velvet drapes creating a sense of quiet buzz that is rare in this world of wood and tile-floored restaurants. We were seated on couches under the stairs – despite being a small place, there’s plenty of space between tables for privacy. We ordered a sticky date pudding to share and couldn’t have picked a better dish on a chilly night. The slice of cake was just the right size to share, served with a large scoop of vanilla icecream and a jug of butterscotch sauce. The cake itself was so fluffy and was served warm, as was the rich butterscotch sauce which was quickly absorbed into the cake. I was delighted that the cake was light rather than dense and the chopped dates inside were divine. Great service, atmosphere and cake? Definitely a winning combination. It wasn’t really possible for me to walk past the pastry display at the Grounds and not buy something. If I could have, I would have bought all the things – it all looked so delicious! 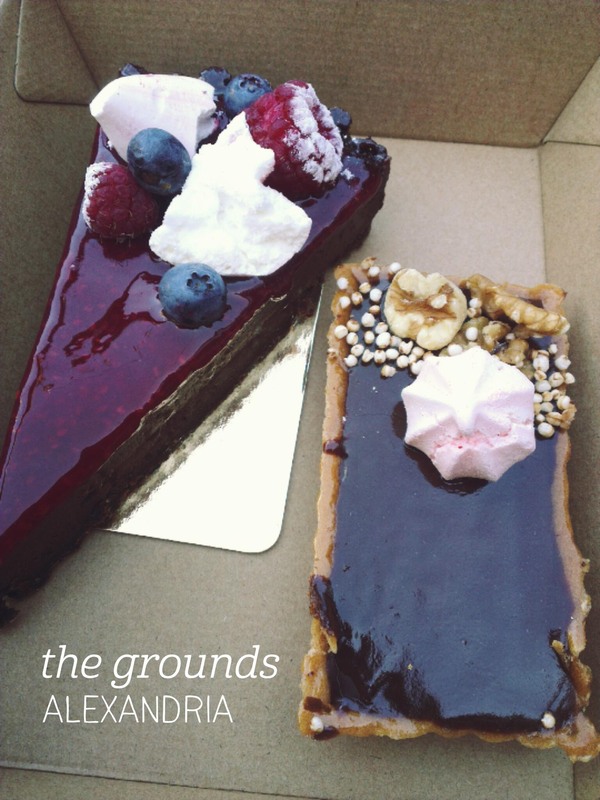 I was very restrained and picked two – the salted caramel tart and the raspberry chocolate torte. Luckily they were to share, because they were both very rich. I only tried a bit of the salted caramel, but oh my it was good. The caramel was so oozy and there was just a perfect amount of salt. The chocolate layer on top added even more goodness, and the pastry around the edge was nice and crisp. I could have happily devoured a whole piece (and will be back to do just that as soon as I can). I had more of the raspberry and chocolate torte, which was sinfully rich. The raspberry glaze on top was lovely and tart, in contrast to the perfectly smooth, silky chocolate cake beneath. The fresh berries on top were a nice break from the decadent chocolate and added some textural contrast. More please! On my visit to The Market Shed’s Twilight Market, my friend and I scoured the stalls looking for the beautiful mini doughnuts posted on Instagram. After getting through a couple of savoury courses, we found them – success! There were six flavours on offer ($6 per doughnut) and we picked one each – Turkish delight and peanut butter. Disclaimer – we didn’t get to eat these on the night so refrigerated them overnight to taste test the next day. 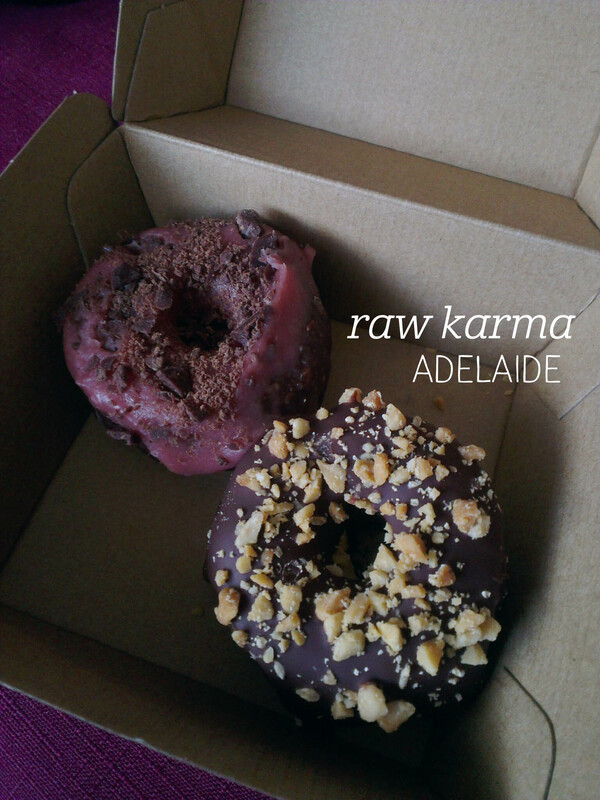 Raw Karma’s doughnuts are vegan, paleo, and gluten-free, and wow are they filling! Whilst they may look small, the dough is less of a dough and more like a fudge – dense and packed full of flavour. The peanut butter doughnut is topped with dark chocolate and crumbled peanuts – it could have had a stronger peanut flavour, but the chocolate is decadently rich. The Turkish delight leaves you in no doubt that’s the flavour you’re enjoying – the rose flavour is beautifully fragrant and cuts through the richness of the chocolate. I’d recommend getting these to share or eat over sometime, as they’re really very dense, but they’re absolutely delicious! A friend recently reminded me of a great episode of the West Wing, where one of the characters explains how she likes to fight cold (weather) with more cold (icecream). That’s exactly what I decided to do when stopping in at Glenelg on my way to the airport. Having been to Royal Copenhagen most recently, I stopped in at their competitor across the street – Andersen’s. The Jetty Road icecream outlets are certainly quieter in winter, but the offerings remain excellent. I went straight to the sorbets, and was very excited to see that they offer blood orange. A regular cup was $5.50 and it took me quite a while to get through the portion. First up, the sorbet was a tad melty, which was surprising in winter, and which meant that I didn’t enjoy the texture as much. On the other hand, full marks for flavour – the blood orange was really intense, but balanced nicely by the natural sweetness of the sorbet. The flavour experience was very much like drinking a San Pellegrino blood orange sparkling drink (yum!). 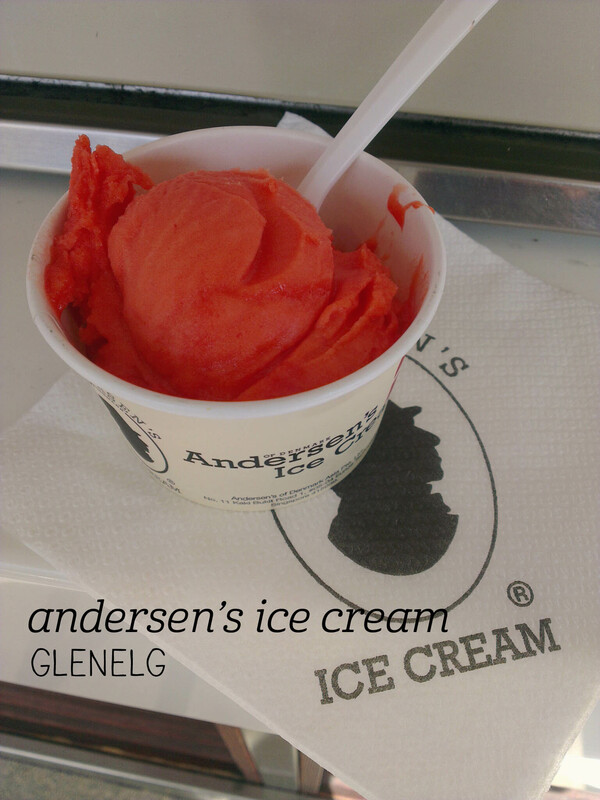 As with all good sorbets, the intensity of the flavour didn’t fade the more you ate, so I’d recommend stopping by and giving Andersen’s a try – definitely delicious for fighting cold with cold! 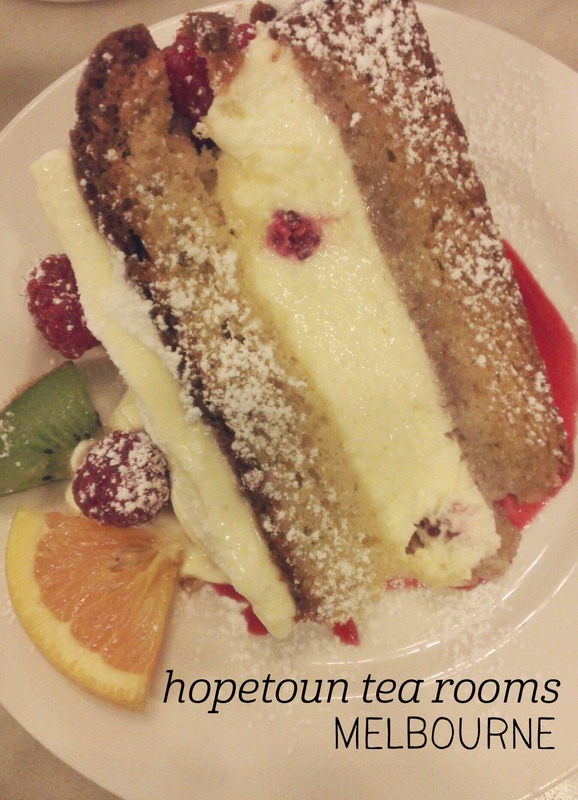 Stopping in at the Hopetoun Tea Rooms is becoming a Melbourne tradition for me. I am completely in love with their window display and their William Morris wallpaper, and I could happily spend days working my way through the tea menu. On this occassion, I met a friend and we managed to get a table without having to queue. The line grew quickly after we were seated, though, so you have to either time your visit well or be prepared to wait. I started with a pot of Buddha’s Finger tea – oolong with peach characteristics. The tea was strongly flavoured, and, as with all of their teas, best consumed fairly quickly, as it started to go bitter as it cooled. I couldn’t resist a big slice of cake, so picked the raspberry sponge as my snack – the piece was quite large and full of cream. The raspberries on top and throughout were plump and fresh, and added a nice tartness to the overall sweetness of the slice. The sponge was lovely and moist, and the raspberry coulis served on the side was divine. Everything here – from the cake to the decor – is lovely.